Here is the documentation of the plugin to better understand how it works. SECOND: Go to the Plugin Settings Page (inside your Settings Admin Menu) and press save. THIRD: Wait your users, while they visits your site this plugin will fetch data from Facebook and Twitter and save them to your database. Depending on how many visits you have these charts may require some days to build. FOURTH: Go to the Plugin Top Stories Page (inside your Posts Admin Menu) and watch the top stories charts and ranks. These four steps should be enaugh to start using the plugin, if you want more detailed informations or need more instructions, go on and read all this documentation. 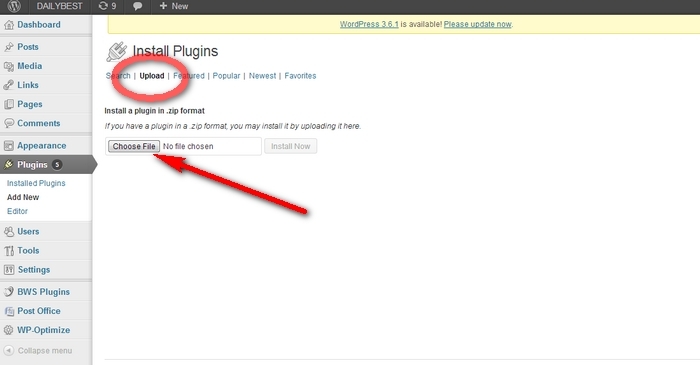 Or use your WordPress plugin uploader to upload the top-stories.zip file: Plugin > Add new > Upload. First, click on the “Top Stories Settings” in the “Settings Admin Menu” and go to the plugin settings page. Press “Save and refresh” or press “Save” at the bottom of the page. The plugin now will automatically grab data from Facebook, Google+, Linkedin, Pinterest, Twitter and Vkontakte social networks while users vists your site. Remember that only when a user visits a page of your site the plugin ask Facebook, Google+, Linkedin, Vkontakte, Pinterest and Twitter APIs for likes and shares counters. This will reduce the number of calls and the traffic. So, if your site has a low traffic rate, don’t worry! It will take a while to grab data for your posts, but -sure- you will take data from all important posts because they are visited regularly! The data grabbed are stored in your database and are used to make graphic charts, discover trending posts and authors and making ranks. This plugin works also with custom post types and attachment pages (read Post Types paragraph inside Settings in the next chapter). 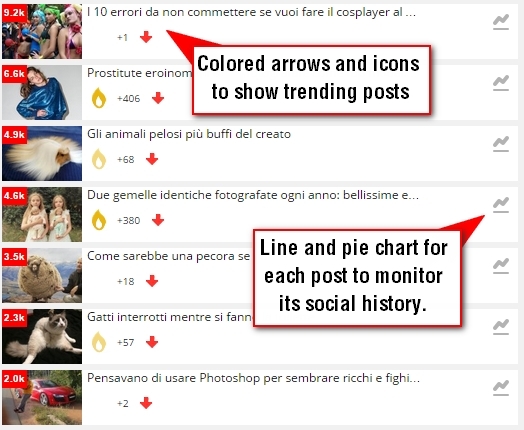 Top Stories Social Plugins brings you charts for a specified period (on the left side) and charts for just today interactions (on the right side of the page). Hovering the mouse on the rank items you will see detail for Facebook, Google, Twitter, Linkedin and Pinterest interactions. 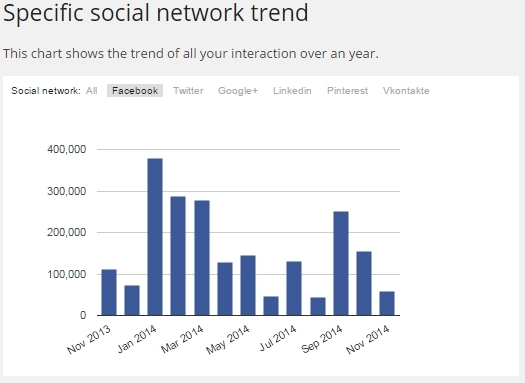 Clicking on the chart icon will show you the history of your social interaction for a specific post. The chart displays a line for each social network interactions. Depending on your audience and on your social power the tree lines could be very different. Click on chart legenda to show/hide lines. In this example I’ve hidden the Facebook chart to see Twitter and Pinterest interactions since Facebook traffic is a lot and the other social disappear. This rank is similar to the previous one but analyzes only the interactions received today. As you will discover, sometimes you have old posts that start to gain traffic again on Facebook, Google+, Twitter, Pinterest, Linkedin and Vkontakte this is amazing! They are old, but now they are going viral. All the controls work the same as the the Top Stories rank over a period. 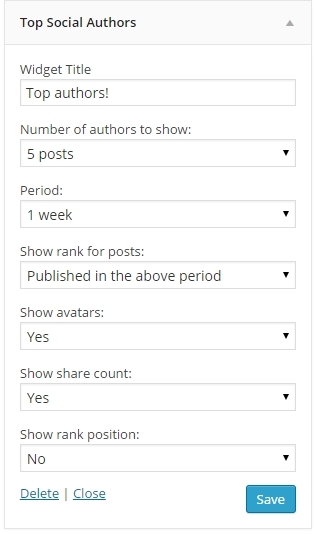 This rank analyzes the posts published in the selected period (1 week, 2 weeks, 1 month…) and shows for each author how many social interactions he has brought to your blog. This can be useful to monitor the authors and decide who award. This is just a list and you can decide the period from the Select control at the top of the page. This rank analyzes all your posts that today has received social interactions and determines the author that is bringing you more likes/comments/shares/tweet just today. 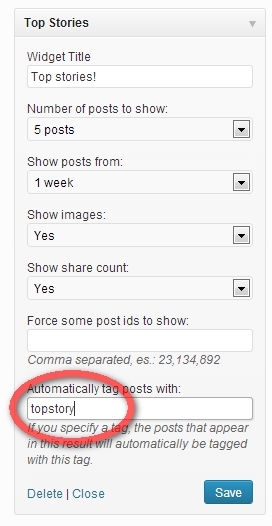 Post types: by default the plugin will fetch data for posts, pages and attachments. If you are using custom post types you can include them by checking the post types you want. 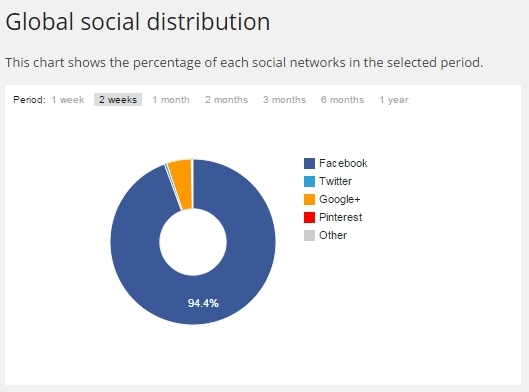 Social Networks: by default the plugin will fetch data for all the social networks available, you can stop fetching data for some of them (actually social networks unchecked are still showed in charts, they will be removed in next releases). Placeholder Image: Insert here the url of the placeholder image to use when there is not a valid image in the post (choose a square file about 150×150 pixel), you can upload a file in the Media > Library and insert here the “File URL” of the uploaded image. This image is used both in the Top Social Stories page and in the Top Social Stories Widget. 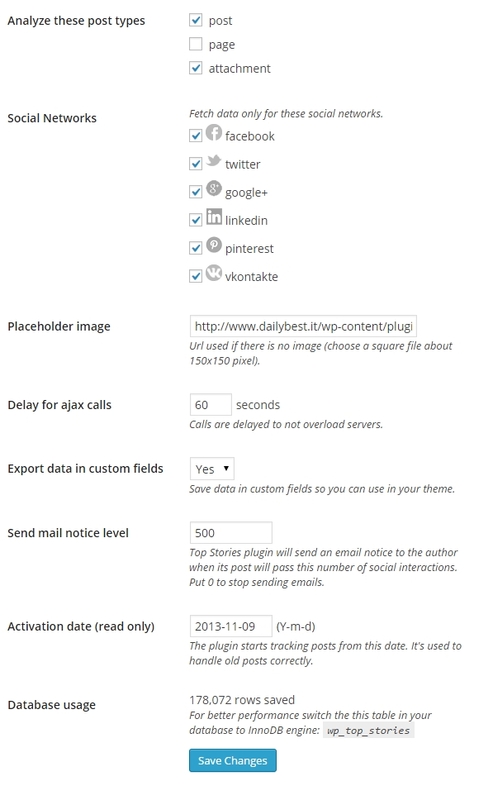 Delay for Ajax calls: This plugin works by calling social networks apis to retrieve data. This happens at the end of the page load, after the specified delay of seconds. Calls are delayed to not overload servers (both your and social newtwork ones) with unuseful calls and database updates. Suggested values are commonly between 30 and 60 seconds, use high values (180 seconds) if you have many thousands of visits per day, use small values (5 seconds) if you have a few hundreds of visits per day. Send email notice level: If more than zero, when total social counter for a post pass this level a mail is sent to the author of the post. Activation date (read only): this parameter is setted the first time you press “Save” on this page and is used to handle social interactions of old posts. This plugin, infact, can’t retrieve data for old interactions (old likes for example) and need to save the date that indicates the zero. Database usage: Here yuo can see a counter that indicates the number of rows the plugin has stored till now. This number will grow. So if you have a very very big and powerful wordpress blog this number could help to monitor your database. 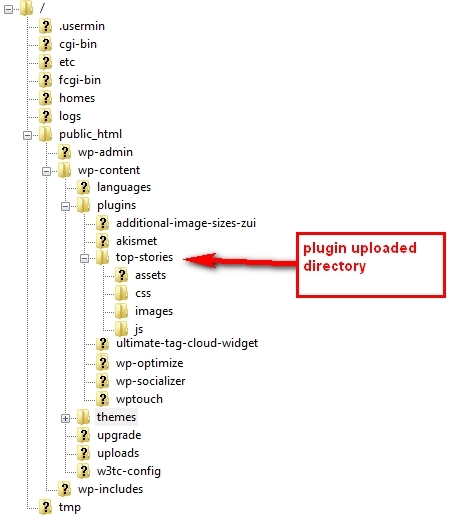 It’s recommended to change the engine of the wp_top_stories table to INNODB. This plugin comes with TWO types of widget: the first type displays top stories (posts) rank, and the second type is for top authors rank. TOP STORIES WIDGET: You can configure as many widgets as you want, to add a Top Social Stories widget go to the Appearance > Widgets section and drag the Top Social Stories widget into the sidebar on the right. To use the option 1 choose “Published in the above period” in the “Show rank for posts” parameter. To use the option 2 choose “Most viral in the above period”. TOP AUTOHRS WIDGET: You can configure as many widgets as you want, to add a Top Social Authors widget go to the Appearance > Widgets section and drag the Top Authors widget into the sidebar on the desired sidebar. As you can see from the above image you can configure the widget to show avatars. The avatars are shown using the get_avatarfunction. For both types of widget, remember that if you have a poor traffic rate (10-1000 visits per day) and many posts, it could take some time before something appears in the widget, since data are fetched when users visit the posts. This plugin comes with two shortcodes to insert both a Top Social Stories rank and Top Social Authors rank inside a post. Show 30 Top Social Stories published in last 365 days, show images and counter, don’t show position. Show 10 top stories published in last 60 days, show images but don’t show counter and force to show the posts number 23 and 761. Show the 100 best posts of all your time of your blog, don’t show images but show social counter, as you can see I suppose that 20.000 days cover all your blog life! Show 10 most viral posts of the last month (it could shows also old posts that became viral in the last 30 days). 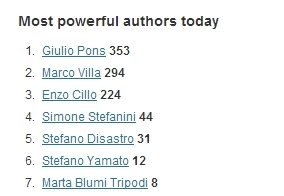 Show 30 Top Social Authors analyzing data from the posts published in last 365 days, show avatars and counter. 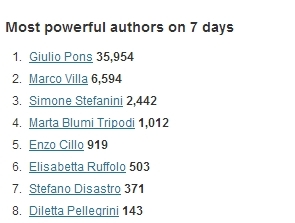 Show 10 Top Social Authors analyzing data from all the posts in the blog and shows the authors that got more likes in the last 7 days, show avatars and weekly counter. Pos=1 means that the output includes the position 1 2 3 4… in the rank. This feature is useful if you want to tag the posts that enter a Top Social Stories rank. For example, you make a Top Stories Widget that shows 5 stories from the last week and you want to tag those posts with the “topstory” tag (you can choose whatever tag you want). If you specify the automatic tag, when a post receive enaugh likes, comments shares and tweets to enter the rank it will be automatically tagged with “topstory“. This can be useful to retrive all the posts that ever entered the Top Social Stories widget with that configuration, because they are simply tagged “topstory“. The plugin is multi language and it’s available for Italian and English. If you want to translate the .pot file is included in the zip, please send me the translated files and I will make available for all users.